SIGG combines 100 years of Swiss quality & craftsmanship with a fresh, fun perspective on contemporary style – delivering a high quality, stainless steel water bottle with both function AND fashion! SIGG features a range of styles and sizes – from colorful Kids bottles to cool Lifestyle Designs to Traveler & Sport bottles, there's a SIGG style for everyone. Plus, using a premium reusable bottle like SIGG greatly helps reduce unnecessary environmental waste caused by plastic PET water bottles. Unfortunately, Americans add over 30 million plastic water bottles to our nation's landfills – everyday! The Water Key fully supports and encourages others to start taking steps toward reducing waste by purchasing high-quality, reusable bottles. A smart, stylish step up from plastic sippy cups, this smaller sized SIGG is perfect for little hands. Non-toxic inner liner is tested to prove 0.0% leaching & reduces chances of bacteria buildup. 100% recyclable & completely reusable. Hygienic, easy to clean, and dishwasher safe. 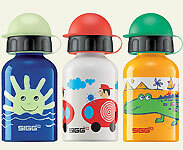 SIGG also offers a range of accessories including caps, cleaning brushes and kid’s grips, which make using and carrying a SIGG even easier and more fun for your child. 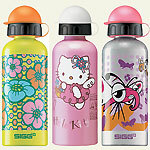 A smart, stylish step up from plastic water bottles, the SIGG for Big Kids is the Perfect size for backpacks & school bags. Non-toxic inner liner is tested to prove 0.0% leaching & reduces chances of bacteria buildup. 100% recyclable & completely reusable. Hygienic, easy to clean, and dishwasher safe. SIGG also offers a range of accessories including caps, cleaning brushes & more! A safe, stylish alternative to plastic water bottles. Great size for work and day trips. Non-toxic inner liner is tested to prove 0.0% leaching & reduces chances of bacteria buildup. 100% recyclable & completely reusable. Hygienic, easy to clean, and dishwasher safe. 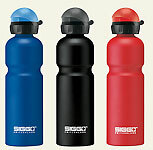 SIGG also offers a range of accessories including caps, cleaning brushes & more! 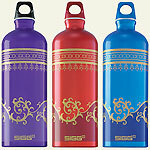 SIGG's popular traveler classic style in a new 1.5L size holds around 50 ounces. It's SIGG's largest reusable bottle! Non-toxic inner liner is tested to prove 0.0% leaching & reduces chances of bacteria buildup. 100% recyclable & completely reusable. Hygienic, easy to clean, and dishwasher safe. 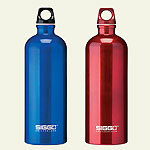 SIGG also offers a range of accessories including caps, cleaning brushes & more! A rugged, yet stylish step up from plastic water bottles, the SIGG Sport Active Touch is ideal for boating, hiking, travel, sports or just everyday use. "Active touch" options utilize a new scratch resistant matt coating with improved grip. Non-toxic inner liner is tested to prove 0.0% leaching & reduces chances of bacteria buildup. 100% recyclable & completely reusable. Hygienic, easy to clean, and dishwasher safe. SIGG also offers a range of accessories including caps, cleaning brushes & more! 0.75 liter = 26 oz.